Devlin had a pretty off practice today. In one on one’s he threw high on probably five or six throws, and this is without pressure since it’s just a one on one match-up for the corner. He struggled with ball placement and though his throws had pretty good zip he was letting them get away from him a bit. He flashed impressive ball placement a couple times, including a nice throw on a slant to Toliver. He showed some good anticipation, zip and accuracy on the throw by hitting Toliver in the hole in the zone on the slant. However, he seemed to be checking down faster than I’d like and on a couple plays he missed an open receiver (Perry Baker twice) so I am wondering about his ability to read defenses a little bit. He has pretty good size and arm strength, but his accuracy was not there today. Taylor had a pretty off practice as well. He overthrew a couple receivers and didn’t have very good ball placement either. He has the arm strength, I am just waiting for him to start placing his throws better. I know he can do it, but he hasn’t shown it yet this week. I talked to him today about an interview and he seemed open to it, hopefully I will be able to get that done in the next couple days. Didn’t see him throw much today, but when I did his passes were usually off target. He struggled making reads today as well, more obviously than Devlin and Taylor did in my opinion. I’m pretty convinced that he is going to be a wildcat QB only at the next level. He will have to convert to RB. Carter looks fast, he has good feet from what I can tell and though I didn’t pay much attention to him today specifically he looks good. He continues to show pretty soft hands. He got stuffed a couple times in the run game, once by Marvin Austin, but I’m not sure they are good reflections of his vision or his quickness. He has pretty good hands, I believe he caught a pass out of the flat today. Royster didn’t impress me much again today, there was a throw to him in the flat that he only got his left hand on from Devlin, wasn’t placed very well. Still doesn’t look very quick or fast to me. This kid blew me away at the beginning of practice today. Yesterday he was dropping easy passes without a defender guarding him and today he was making snags away from his body after creating some separation in one on one drills. He didn’t look quite as fast with pads on, but he still moves well. He needs work on his route running, but he definitely has the suddenness, the speed and the burst to be an effective route runner, just has to work at it. His hands look totally different than they did yesterday, he had to be nervous at the beginning of practice. He showed some route running ability by getting separation on Van Dyke and running a nice curl on Justin Rogers (who has looked great) and running it so well that Rogers lost his footing and fell down as Baker made his break. He made a body catch later in the practice, so his hands aren’t amazing, nor is his route running, but he looks much better today than he did at the start of yesterday’s practice. He looked like a different player almost. I’ll be looking for more consistency later in the week, hopefully I will be able to talk to him and get an interview. Jean had a much better practice today as well. He doesn’t run very good routes, but he has some suddenness and he absolutely shook Van Dyke on one route and got a lot of separation. He showed much better hands and caught the ball well away from his body and even dug out a low throw for a nice catch. He struggles with his footwork when running routes though, and it limits his ability to create separation. I’m not sure how much quickness he will ever have coming in and out of breaks, but he does have good speed and looked fast in pads today. He also showed some ability to adjust to the ball when it is in the air, which is good. With his size, speed and potentially good hands he presents some value to be sure. He looked much better today than he did yesterday. He and Baker had great practices. Toliver is my favorite WR here and he had an up and down practice, but is definitely still the best WR here in my opinion. He has very reliable hands though he dropped two passes that I saw today and both of them involved contact. On one play he ran a good slant route and caught the ball but as he caught it Josh Thomas, a corner from Buffalo, laid a big hit on him and jarred the ball loose. Later he ran another slant and shied away from contact that he knew was coming a bit and didn’t make a play on the ball, though it was not very well thrown. It’s pretty apparent that he doesn’t like contact and is more of a finesse receiver, so I don’t think he will want to go over the middle a lot in the NFL. However, his hands are the best of the receivers here in my opinion and he showed some good route running today. He absolutely burned Mario Butler on one long play but it was over thrown. He looks like a solid 3rd or 4th rounder to me for sure. Shorts started out slow today and actually lost his footing a few times at the beginning and one more time later in the practice. He was tentative in his breaks after the initial footing problems and you could tell he was taking his breaks a bit slower to make sure he didn’t fall down so he didn’t waste the rep. He adjusts pretty well to the ball, but his hands are inconsistent in my opinion. He drops some catchable balls and also brings some in. He looks like a 5th/6th round guy to me right now. Turner seems to be the worst wide receiver on the East squad. He has struggled to create separation, he doesn’t have very good speed and his hands are inconsistent. He’s had a tough couple of days. I didn’t see much of Gantt today but he seems to have solid hands. I want to see him blocking more because I have heard a lot of good things about him as a blocker. Arkin had an up and down day. A couple times he had effective blocks on Marvin Austin but Austin also beat him on a couple run plays, though he looked good in pass protection against him. Arkin struggled against Martin Parker, the DT from Richmond. This is going to be a really interesting match-up to watch because they have had some good battles already in the first two days. Arkin got beat by a nice swim move by Parker and then Parker bull rushed Arkin into the pocket again. Arkin definitely has some ability though, he just needs to play with more consistent leverage. I haven’t been very impressed with Hairston. He is huge but he doesn’t look like he has good feet and he got away with a hold, a pretty blatant one where he was just tugging with one arm on the DE’s jersey as he ran around him to try to pursue from the backside on a running play up the middle. He looks like a late round pick to me so far. Parker had a pretty good day when I saw him today. He beat Arkin twice with swim moves and bull-rushed him into the pocket effectively on another play. He has a pretty wide body and he has natural leverage because of his size, he seems to be strong as well. In a system that likes defensive tackles to penetrate and get upfield he definitely has some value. Austin had a solid practice, but it wasn’t dominating. He shows signs of his great ability but he drew a lot of doubles today. He fought hard against them but when you are doubled there’s not a lot you can do. He also struggled a bit to get off blocks from Arkin in pass protection, but did a bit better versus the run. He holds his ground well versus one on one blocks for the most part, and shows some violent hands to shed at times. His hand usage could be more consistent in my opinion. Greg looked good today, he played well. He fills well versus the run and a couple times he read the play in literally half a second and then moved well in pursuit. He plays well downhill and I think he could be a perfect fit as an ILB in a 3-4 defense. I am not sure how comfortable he is in coverage, as he looks a bit tentative at times. I’ll be watching him in that aspect this week. But I think he’s a perfect fit in a 3-4. I really like Dent and he continues to fill well versus the run and put himself in position to make tackles in the running game. Like Greg I think he is a perfect fit in a 3-4 defense at ILB, and I am not sure how good he is in coverage. I try to watch him but there is a lot going on, so it’s hard to do at times. However, I am very high on Dent. He is a tackling machine. Rolle is an agile player and he looked very comfortable in coverage to me today, especially in zone. He is still very undersized though, and that hurts him against the run. Rogers looks like the best corner on the East to me. He has a great motor, pretty good closing speed and he makes plays on the ball and has had a bunch of pass deflections in the first two days of practice. He’s a smaller guy but I love his effort and his ball skills. I don’t know how he is at tackling yet since they haven’t been tackling practices. He has had good coverage for the most part, but Baker did break his ankles on one curl route. However, he stuck with Baker on a streak route stride for stride. He has had a great couple days of practice. Butler has not impressed me thus far. He got worked a couple times today in coverage though on a couple bad throws he managed to make a play on the ball for a deflection. He has just underwhelmed me thus far, he doesn’t seem like a mid-round pick to me right now. Thomas had a solid practice today. He laid a couple big hits on people, both of them jarring passes incomplete when they would have normally been catches. He definitely packs some punch as a hitter. I’m not sure how well he locates the ball in the air, but I’ll be watching him more later this week. Van Dyke has struggled a lot the past couple days. He got worked on a few routes today and gave up pretty easy separation to the receivers he was defending and didn’t seem to have much ability to make up ground or close to make a play on the ball. He has definitely been the worst corner for the East. I didn’t see much of Nelson today but he did intercept a pass off of Pat Devlin during practice. Devlin threw the ball late and was staring his receiver down and Nelson read his eyes well, got in front of it and made a nice interception look pretty easy. Hopefully you enjoyed these notes, thanks for reading! Look out for more posts the rest of the week! Hey everyone. Sorry it has been so long since my last post. When I got my computer fixed it seems that all of the games I had downloaded from last year that I planned on re-watching to get a better feel for a lot of seniors and juniors before the season started have either been lost or they are in a very different folder or location on my hard drive than they were before. I tend to believe they are deleted, which is too bad. But I have also been very busy because I just got back to college a week ago so I have been adjusting to that, settling in to my new room, and obviously working for my football team here. I attend Beloit College and the football team here is Division III, but I love working for the team filming their games. They’ve come a long way since I got to campus, so I am excited for their season to start as well as Division I ball and the NFL regular season obviously. Anyways, those are my excuses for not posting lately. Hopefully they are good enough for you so you keep coming back and reading my blog! I am quite unhappy that I lost all of those games that I downloaded, but I’ll get over it. I figured that I would tide you all over to my next scouting report or game-breakdown with some rankings. Here are my updated QB rankings as of today, August 25th, for Seniors and Juniors that are probable to be in the NFL Draft. That obviously does not include Andrew Luck, a redshirt sophomore QB at Stanford, but I think it would be a mistake if he left even after a great sophomore season, so I won’t involve him in these rankings even though he has 1st round potential. Here you go! Enjoy! Mallett has as much potential as any NFL QB I have ever seen, and ultimately I think his combination of size and arm strength will result in him being the first QB drafted. 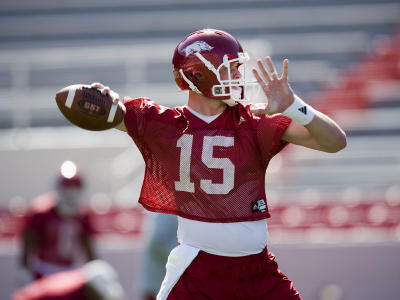 1- Ryan Mallett, QB, Arkansas- I know I am ranking Mallett #1 on my rankings, but I am not on the Mallett bandwagon yet. Mallett has an absolutely amazing arm and he can make just about any throw you ask of him and it will have zip on it. I have seen him throw lasers off balance without his feet set, which speaks to his outrageous arm strength. He can put the ball where-ever he wants it, but sometimes his accuracy will falter and he will sail passes high or miss a receiver. Some think that has to do with his accuracy, but I think his accuracy is quite impressive. I think the issue is with his footwork. He throws off his back foot, without his feet set, his drops don’t look very good to me and he generally gets away with not having polished footwork and fundamentals because of his absurd arm strength and his naturally talented arm for putting passes where he wants to. But if he wants to improve his accuracy and become an elite QB prospect like so many seem to think he already is then he needs to improve his footwork considerably in my opinion. I personally think Mallett will end up being the first QB selected for a few reasons. First, everyone loves a big arm and Mallett has one of the best arm’s I have ever seen. He can make any throw and he can put a lot of zip on anything he wants to. Second, he has great size to go along with his arm strength. Being able to see over the offensive linemen in front of him so he can read a defense at his height and size makes him even more intriguing. The third thing is a combination of the previous two: Potential. He has absolutely sky-high potential, even if I don’t think he’s a very safe prospect at this point. If he can polish up his fundamentals and develop before he declares after his junior year (in all likelihood) then he could very well be the #1 overall pick in the draft. He just has so much potential. But I am always wary of those types of players because it seems that so often players with Mallett’s ceiling get drafted assuming they will get there and then they never do. But he is my #1 QB right now because I think this could very well be where he ends up. Plus I don’t think it will be possible for Locker to live up to the hype he has gotten as the potential #1 overall pick. He is slightly more safe than Mallett in my opinion, but he doesn’t have the same potential. I just doubt that he will progress as much this year as he did between his sophomore and junior season, which makes me think he will inevitably fall. Ponder is a safe pick in my opinion, but I think he has the potential to be a quality QB in the NFL. 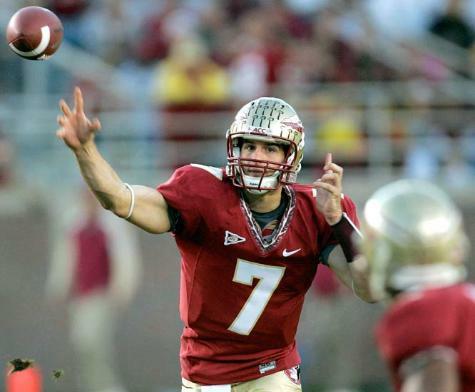 2- Christian Ponder, QB, Florida State- I am a big Christian Ponder supporter despite being a huge UNC Tar Heels fan. He led a pretty amazing comeback against my Heels last year as a Junior, and I think he is going to have a great senior season leading a potentially explosive offense at FSU, and if he improves again between his junior and senior seasons and plays like he did against UNC last year more often this year then I think he will be a top 15 pick. He has the ability to be a very good NFL QB in my opinion. Some will be surprised that I have him over Locker, but I think Ponder is more NFL ready even if he doesn’t have the same potential that Mallett and Locker have. I am very close to sold on Ponder, so I am very excited to see how he plays this year. 3- Jake Locker, QB, Washington- If Locker takes strides similar to what he did last year again this year then I think it will be hard to argue against picking him in the top 5. I just don’t think that is realistic since he looked like a totally different QB last year than he did in his first two seasons. He definitely has things to improve on, like stepping into all of his throws, not taking unnecessary chances and just throwing the ball away, going through his progressions and using his eyes to deceive the defense. I can’t wait to see how he does this year, but it seems to be a trend that the #1 rated QB or prospect in general tends to have an underwhelming senior year. Hopefully that isn’t the case with Locker. Though I could definitely see him “sliding” if he doesn’t improve as much as some expect, but unfortunately that is what I expect will happen. Some prospects get over-analyzed when they come back for another year like Locker did, and while I think it will give scouts more time to nit-pick at his game, he has also been compared to John Elway, he has been deemed the mostly likely #1 overall selection in the draft, and everyone seems to be expecting him to progress as much this year as he did the year before. That isn’t fair, but I don’t think he will be able to live up to those lofty expectations this year. On the plus side for a team in the mid 1st-round that needs a QB, Locker may just be available and he could end up being the best one out of Mallett, Ponder and himself. We will have to see what happens, but I expect Locker’s stock to drop. 4- Nathan Enderle, QB, Idaho- I watched a couple of Enderle’s games last season and I was incredibly impressed. 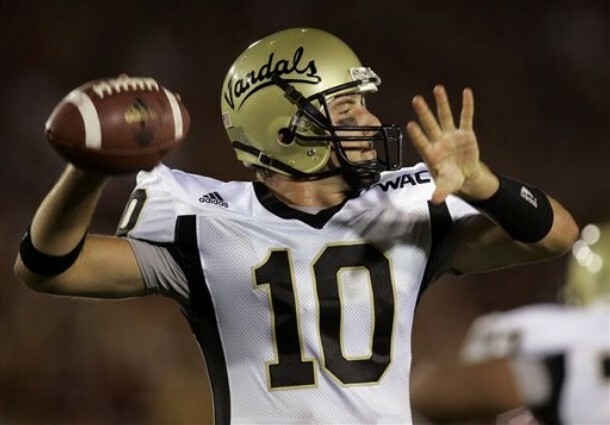 He has good arm strength, good accuracy, he is pretty fundamentally sound and runs a pro-style offense at Idaho. He not only showed great ability to use his eyes, go through his progressions and make good decisions in the games I watched, but he led the crucial 4th quarter drive to win the game against Bowling Green with a touchdown with well under a minute left in the game and then a two point conversion to win it. It was truly a spectacle to watch and it made me a believer in him. I can’t wait to see what he does as a Senior. Hopefully he manages to overcome losing four of his five starting offensive linemen from last season and show everyone what I saw when I watched his games from last season. If he was more under the radar he would absolutely be my sleeper, but I’d feel like a cheater since I think he has already demonstrated how good he can be. 5- Kirk Cousins, QB, Michigan State- I really like Cousins but I don’t think he would get drafted before the 3rd round if he came out this season. I am probably much higher on him than anyone else at this point, but that isn’t what matters to me. I’m not afraid to go out on a limb and that is why I have Cousins this high. He runs a pro-style offense and Michigan State, he had 19 touchdowns and only nine interceptions as a sophomore and he wasn’t even the full time starter since Keith Nichol (who has since changed positions to wide receiver) was worked in fairly regularly, even after Cousins got the starting nod. He nearly won the game for Michigan State against Notre Dame with a late touchdown drive, and has shown poise and good decision making when I’ve seen him. He had his ups and downs as a first year starter, but I think he has the potential to be a very good NFL QB. He has mobility to run and extend plays, he has pretty good arm strength and accuracy, he is the leader of the offense and will be a three time captain by the time he is a Senior (assuming he stays) and he has produced. If he can step it up against the big time Big 10 teams this year (like Wisconsin, Iowa, Penn State and in addition Notre Dame) and play better in those games then he will really legitimize himself as a NFL prospect in my opinion. He is definitely my sleeper in the junior QB class, and I have been high on him since last fall when I saw him play against Notre Dame. We will have to see how he does this year, but I expect him to improve quite a bit. That is why I have him so high on my rankings. Johnson has potential because of his arm strength and athleticism, but he needs to refine his mechanics and streamline his throwing motion. 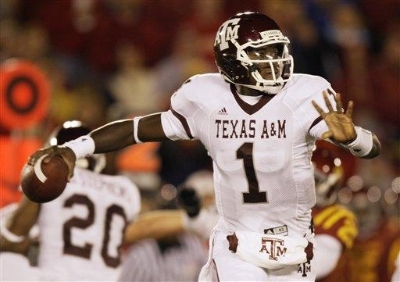 6- Jerrod Johnson, QB, Texas A&M- I am not the biggest fan of Jerrod Johnson, but I think as a developmental QB he could be well worth a 3rd-4th round pick. I have Devlin rated below him for the time being because I have only seen limited footage of him whereas I have a pretty good feel for what Johnson is capable of since I have seen him play a number of times, both live and when I am specifically scouting him. He has impressive arm strength, good athleticism and good size, but his throwing motion is a little off and he tends to dip the ball below his chest before he releases the ball. He needs to polish his footwork a lot and overall his mechanics aren’t very impressive to me. I have him over Devlin right now because he has more athletic ability and arm strength than Devlin does accuracy and experience as far as scanning the field and going through progressions. 7- Pat Devlin, QB, Delaware- I haven’t seen Devlin play a whole game, but I have watched all the footage of him that I could and he looks like a solid QB prospect to me. He has a clean release, solid arm strength and impressive accuracy. He does a nice job on touch throws, but also shows some zip on passes to the sideline. He throws some nice ropes to the sideline. They aren’t going 100 mph, but they aren’t hanging in the air too long as far as I can tell. I haven’t seen him go through many progressions though, which is concerning. He usually stares a receiver down and either throws it to him, scrambles or checks down from what I have seen of him. Hopefully I will be able to see him play in a couple of full length games during his senior season, but from what I can tell he is going to be a developmental guy because he runs a lot of spread formations, not to mention he doesn’t look like he goes through his progressions well, he doesn’t use his eyes well and I think his footwork needs to be improved. If he had a stronger arm, better footwork or if he scanned the field better I think I might have rated him higher than Jerrod Johnson, but Johnson’s athletic ability and arm strength make him a more valuable prospect based off of what I have seen. Dalton didn't impress me against Boise State, but he has an opportunity to redeem himself as a senior. Especially now that TCU is ranked high enough that an undefeated season could mean a BCS Championship birth. 8- Andy Dalton, QB, TCU- I’m not very high on Dalton, but from what I understand he is a pretty good leader and he has had a great career at TCU. I was not impressed with him against Boise State at all, but I understand that was one of his less impressive games so I don’t want to judge him just off of that game. I think he has the potential to get drafted in the 4th-5th round right now but I haven’t seen enough of him to evaluate him the way I would normally like. It will be interesting to see how he does this year because TCU will have a chance to get into the National Championship game if they go undefeated. I look forward to seeing how he does against Oregon State in week one. 9- Tyrod Taylor, QB, Virginia Tech- I wrote up a post on Tyrod Taylor earlier in the summer and I have to say I think he has progressed a lot since he had his redshirt taken off and he started to electrify Virginia Tech again. He looks like a QB who can run well rather than a runner who can pass well, which I can’t say I ever thought I would say about Tyrod. He still has progress he can make obviously, but he has come so far in the last few years that it’s hard for me to say that he won’t be drafted in the 5th-6th round range at this point. I think he will have a good senior season, and if he does I would be shocked if he didn’t get drafted. I am very interested to see how he does in arguably the most important season of his career. 10- Terrelle Pryor, QB, Ohio State- I would have been hard pressed to put Pryor in my top 15 QB’s before I watched him against Oregon in the Rose Bowl, but he made me pause and actually consider him as a potential QB after I saw that game. If he plays more consistently like that then he will definitely move up on my rankings. However, before that I thought he was an absolute joke of a Quarterback, so I am definitely not ready to say that he has arrived and will take the Nation by storm. He has great size and sky-high potential because of his incredible athletic ability, but he is still a great athlete that can play QB to me, not a great QB with incredible athletic ability for the position. It will be interesting to see how he does this year, but I can’t say I expect him to play consistently well like he did in the Rose Bowl last year, so that is why I have him at 10 as of now. 11- John Brantley, QB, Florida- I know that John Brantley doesn’t have much experience, and I know he hasn’t led his team to a lot of wins like Stanzi, McElroy or Tolzien have, but I think Brantley has the ability to be a quality QB prospect. I have watched all of the footage of him that I can find, from the Spring Game this past summer to any throw I could find of him on YouTube. What I see is a pretty good athlete, a guy with good size, a strong arm with good zip on his throws, good accuracy (in the clips I have seen, which I admit have been limited), and even the ability to go through a couple of his progressions. That impressed me because he did as good of a job, if not better, of doing that than Tebow did. I think Brantley has one of the toughest jobs in the entire Nation this year replacing a local and national legend in Tim Tebow at QB of the Gators, so it will be really interesting to see how he handles replacing him on and off the field, because that is a lot to live up to. I think he can do it though, so it will be interesting to see how he plays this season. I think he will have a good first season as a starter, personally. 12- Ricky Stanzi, QB, Iowa- Some are higher on Stanzi than I, but I am not a big fan of him. He runs a pro-style offense, or something similar to a pro-style, but he throws a lot of shorter throws and I am not very impressed with his arm strength, the zip he puts on throws and he makes some bad reads and forces throws into coverage at times. It will be interesting to see how he does without his security blanket Tony Moeaki lining up with him this year. He has some weapons he can take advantage of, so I expect him to have a good year, but I don’t know how much of a leader he is, how good of an arm he has or how well he reads a defense. To me he is a 6th round pick right now, because he has proved he can win and produce when he has to, especially late in games, which is something that has always impressed me. Delivering when the game is on the line is the ultimate test of a quarterback’s competence in my opinion, or of any other position. We will have to see how Stanzi does this year, but I’m not a big fan. 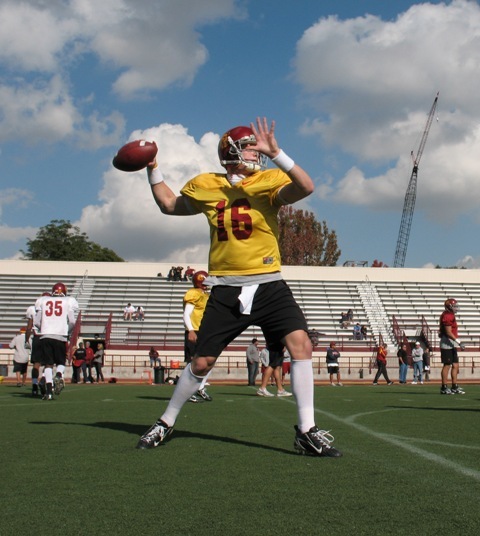 13- Greg McElroy, QB, Alabama- McElroy has some poise, but to me he isn’t much more than a game manager. He’s a pretty good one though, because without some of the throws he made over the course of the season I don’t think Alabama would have won the National Championship. But in my estimation he was just a cog that had to do it’s job for the team to win, not a key piece. He doesn’t look like he has a very strong arm, he isn’t overly accurate, he isn’t a fiery leader, he doesn’t have great size, and I’ve never seen him take over a game when his team needs him to. He has put some nice drives together, but they aren’t drives that make me say “Wow, now that is a good quarterback.” They are drives that make me say “Wow, that is a good team.” It will be interesting to see how McElroy does this year, but I don’t have very high expectations for him to be honest. 14- Scott Tolzien, QB, Wisconsin- Tolzien is a solid QB, but he is nothing special in my opinion. That certainly endears him to Wisconsin fans though, because he is leaps and bounds better than recent QB’s they have had, like Sherer or Evridge for example. He has solid arm strength and accuracy, he has decent size and athleticism, but he isn’t overly poised and doesn’t read defenses particularly well in my opinion. But that was his first season as a starter, so it will be interesting to see how he looks with a year under his belt as he auditions for a potential job in the NFL. He could make a career out of being a back-up, so it will be interesting to see how he does. Mustain may not be a starter at USC, but that doesn't mean he isn't talented. I think he is worth a 7th round pick at this point, and if he performs well in mop-up duty and posteason games... he could move up even higher. 15- Mitch Mustain, QB, Southern Cal- Mustain is definitely under the radar, but before he transferred from Arkansas he was a starter as a freshman and he wasn’t half bad from what I understand. He could have been a four year starter had he seen eye to eye with Houston Nutt, but he went to USC and has been a back-up ever since. However, he definitely flashed ability when he threw five touchdowns in USC’s Spring Game, so hopefully he will get to play in garbage time so I can see his mechanics, his arm strength, accuracy, and everything else. Hopefully Matt Barkley doesn’t get hurt, but USC has said that they would be comfortable handing Mustain the reigns to the offense, which is high praise considering how bad Aaron Corp looked in a reserve role last season. Mustain said that he received 10 offers to leave USC after the two year postseason ban was announced, but he elected to stay at USC because he wants to master the pro-style offense they run so he can adjust to the NFL quickly. That kind of maturity is impressive, and that makes me like him. I think he is definitely worth a 7th round pick at this point, and if he looks good in postseason games… he could be worth even more. 16- Ben Chappell, QB, Indiana- Chappell is definitely flying under the radar right now, but I spent a good deal of time figuring out whatever I could about him and seeing all the footage of him I can without having a game on my hard drive to evaluate him. He has a bit of a hitch in his throwing motion which is a little concerning, but I am seriously considering him as my sleeper QB for the Senior class. I think he has the potential to move up boards and get drafted, but I can’t rank him above other QB’s that I have seen and gotten a feel for before I have seen him play an entire full length game. As it stands now I have only seen selective clips of him. But he seems to be a good leader and he has a pretty strong arm along with solid size and production. It will be interesting to see how he does this year, I am excited to see him play an entire game. Harris needs to learn to put zip on his throws, because he will struggle mightily in the NFL if he puts as much air under his passes as he did last year. 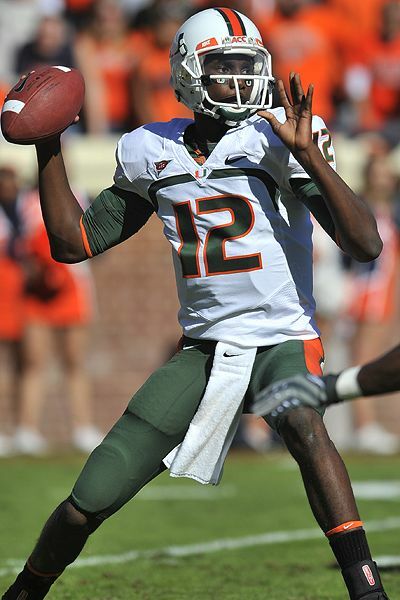 17- Jacory Harris, QB, Miami- Harris is a good QB, but at this point I don’t think he is good enough that I would draft him over any of the Seniors I have ranked ahead of him. He needs to continue to progress and work on some of his issues, like his throwing motion, his release point, and the amount of touch he puts on all of his throws. I don’t know if he will ever stop putting that much touch on his passes, and that really hurts his potential in the NFL in my opinion. There are times that you need to put some zip on a throw to get it completed, but Harris either doesn’t understand that or he can’t do it, and neither is a good thing. It will be interesting to see how well he does this season, but I think that he has a lot to work on and that is why I ranked him so low. 18- Blaine Gabbert, QB, Missouri- Gabbert has good size and solid arm strength and accuracy, but he just doesn’t “wow” me in any aspect to be honest. He plays in a spread, had good production and in general performed decently last year. I don’t think he’s a very special prospect, so as a junior if he came out I don’t think he’d get drafted before any of the guys I listed who, for the most part, have more experience and potential. I look forward to watching him to see if he develops into a better passer as a junior though. 19- Jordan Jefferson, QB, LSU- Jefferson has a lot of athletic ability along with good size and arm strength but his accuracy is inconsistent and something about his throwing motion looks off. It looks slow to me and I wonder how much it can be tweaked to speed it up. He has never impressed me that much, but he still has potential and that is why he made my list. I wonder how he will look this year, but I hope he will continue to develop and learn to make better decisions and place the ball better. 20- Nick Foles, QB, Arizona- I had Foles much higher on this list but then I saw his throws against USC and I lost a lot of confidence in him. He checked down a lot, he stared his receivers down on almost every snap, and he generally looked unimpressive. Perhaps he will prove me wrong for ranking him this low this season if he holds onto the starting spot and learns to read defenses better, but I am not really holding my breath on that. I will still watch him, but I don’t expect to see anything special. He was productive last year, but if he can’t read a defense then it doesn’t really matter how productive he is: he won’t make it on the next level. Again, I am sorry about the long time between these posts. I’ve been working a lot for the football team here and it has just been a busy couple of weeks for me. Hopefully this will tide you over until my next post. Thanks for reading!